Since the infamous ’02-’03 season, when the Bonnies played Virginia Tech, Michigan, Boston College, #3 Alabama, and #5 Uconn, the Bonnies have had relatively soft non-conference schedules. This strategy was most highly scrutinized after the 2016 season ended in a snub from the NCAA. Regardless of what actually transpired in the committee discussions, the NCAA stated it was due to a weak SOS. Tim Keeney fixed that this time around. The Bonnies had the chance to play three Power 5 schools, (Maryland, TCU, and Syracuse) along with their usual mid-major foes. It wasn’t always pretty or to plan, a loss to Niagara and a Jay Adams injury certainly tempered expectations, but 10 wins is 10 wins. And 10 wins with their schedule is a great 10 wins. Along with wins over potential NCAA teams Vermont, Buffalo, and Yale, the Bonnies added two big-time wins on their resume. Their 63-61 win over Maryland in Florida righted the ship after a terribly disappointing start. Maryland hasn’t performed as well as expected, losing the only two other games they’ve played thus far against strong competition. Make no mistake though, Maryland is a talented team (#34 kenpom) and should find themselves on the right side of the bubble with a solid performance in the Big Ten. And then came their biggest win in over 15 years; the Bonnies hung on for dear life against ‘Cuse, thanks to Saint Nick’s greatest miracle yet, a win without a basket in the final 12 minutes of game action. I’m somewhat certain that the local seventh grade middle school team could have scored more than the Bonnies in the second half, but it doesn’t matter. 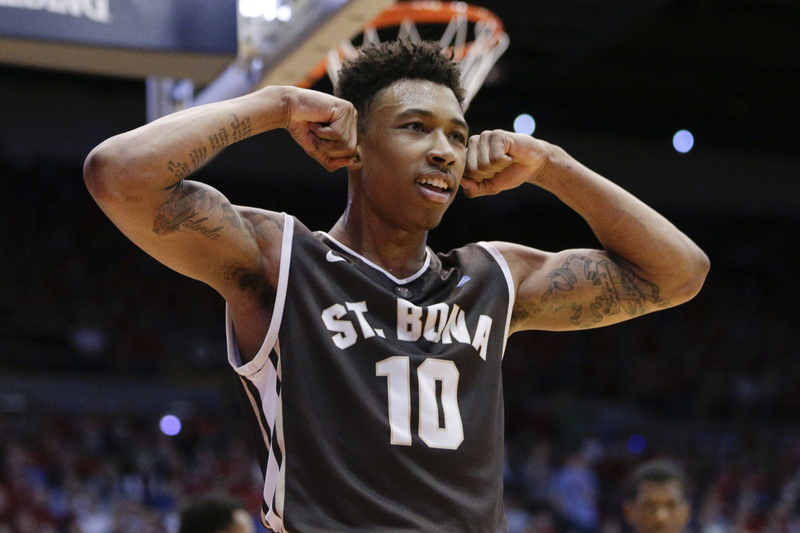 The Bonnies finally did it. Aside from this win giving them tons of media attention as an at-large contender, it’ll live on forever for all Bonnies fans who finally got see Goliath hit the ground. You know what goes here. A two point loss to a weak Niagara team after seven months of anticipation is about as bad as it gets. But here’s a slightly different take on that game. I think it was good for them. Yes, you are good team. Yes, you can compete for an NCAA bid. Yes, you will wallop many of the teams you play this season. No, you cannot expect to win just because you showed up at the gym. This was a lesson the team needed to learn the hard way. I don’t think the fabulous season they’ve had since that game would have happened without this wakeup call. In the scheme of things, if this team plays as well as they are cable of, losing the first game without Jaylen Adams, shouldn’t keep them from the NCAA tournament. It may feel like we’ve played 30 games already, but there is a long way to go in this season. So much can still happen, and basketball is so unpredictable, but as a fan, it’s hard not to get excited about where the Bonnies stand. It wasn’t long ago that the Bonnies were laughingstock of the A-10. Now, they’re the consensus pre-season #2, with a real chance at an NCAA at-large bid. How can you not be excited about that? After the opener, they won the ones they had to win, beat Maryland without Jaylen Adams, slayed the dragon in the Carrier Dome, and firmly placed themselves amongst NCAA at-large hopefuls. That’s enough for an A in my gradebook.